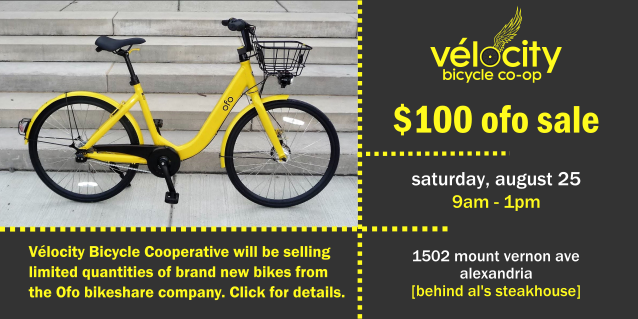 Vélocity Bicycle Cooperative will be selling limited quantities of brand new bikes from the Ofo Dockless Bikeshare company, which recently withdrew from the Metro DC market. We are selling these fresh-out-of-the-box bikes for $100 each at our warehouse (behind 1502 Mt Vernon Ave Alexandria, VA 22301 ) from 9:00am-1:00pm on Saturday August 25th. *Please note that bikeshare bikes are designed to be very durable and are constructed with theft-resistant proprietary parts, which may prevent adjustment or eventual replacement of certain parts. Vélocity will do its best to repair or adjust these bicycles in the future; however, please be aware that we may be unable to replace or repair some parts. Please feel free to contact us with any questions or bulk orders at spokeperson@velocitycoop.org.